Rancho de los Animales for the Disabled, Inc. is a 501 (c)(3) non-profit corporation. Call us at (805) 459-9083 or (805) 458-6000 to let us know you're coming ... we can arrange horseback riding, a group visit, birthday parties and private tours. 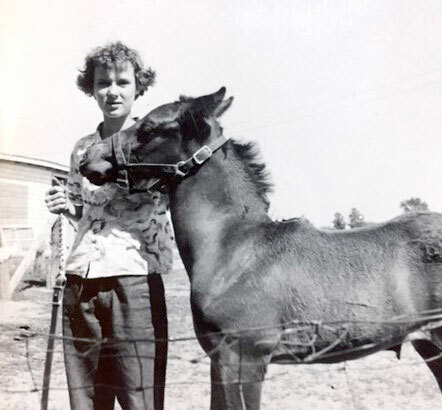 Beth Currier was a horse-loving girl in Los Angeles when she contracted polio in 1955 at the age of twelve. Her doctor said she would never walk again, let alone ride her horse, but he didn’t know Beth. Two years later, she traded her wheelchair for the back of a horse as part of her therapy. You can imagine the thrill every time she was lifted out of that wheelchair and into a saddle. Besides restoring her mobility and upper body strength, the freedom was exhilarating! In 1981, she moved to a one-acre ranch in Nipomo and started giving free rides to the disabled. By 1983, she had outgrown that ranch and moved to an eight-acre parcel on the Mesa in Arroyo Grande. Beth has been an activist for the disabled for many years. In 1978, she became the first Counselor for Disabled Students at Allan Hancock College and served as the Assistant Coordinator of the Disability Resource Center at Cal Poly for twenty years. She’s an advocate for Californians for Disability Rights, Inc., writing governors and senators, promoting access in our national parks. In 1984, she received the first service dog. Through her efforts, RAD received the Service Organization of the Year award in 2003. In 2007, she was honored with Paul Wolffe Accessibility Advocacy Lifetime Achievement Award. Beth loves her work; her enthusiasm and positive attitude are infectious, but her biggest reward is seeing the smiling faces on the folks who were told they couldn’t.